When the UPS delivery guy dropped-by Name for Fame contest winner Jakob Pavli’s Austrian crib, Jakob was so stoked he had to get a photo then and there. 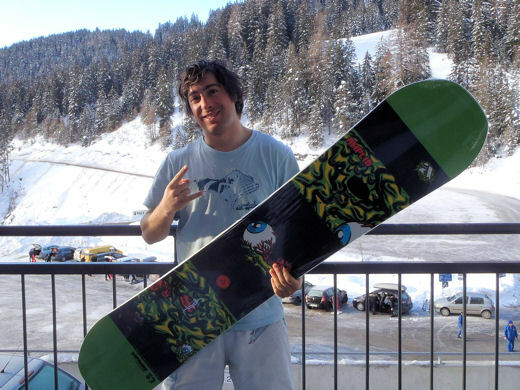 Nevermind the -20 degree temperatures the Alps have been experiencing, Jakob risked hyperthermia in a T-Shirt and Boardies with only the horns of rock and a Blue Steel pose to protect him from the elements to get us a photo with his new Dopamine 153. Thanks for the photo Jakob… enjoy the shred!